This year there were numerous panels and events that any fan of RT, Game Grumps, or gaming in general would have loved to participate in. It was obvious that the guardians took great care to ensure that panels ran smoothly and maintained a fun, positive experience for everyone. The panels were large and accommodating to the amount of people at the convention. Certain “hot topic” panels were even held twice to allow people who didn’t make it to the first panel to be able to still see and experience the panel. 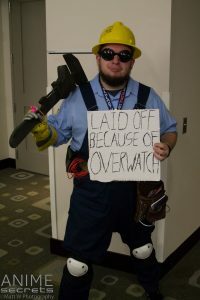 There were also a few events, such as the “Immersion” Room, a real-life Five Nights at Rooster Teeth haunted house, that helped keep people occupied between panels. Overall the panels have drastically improved, and if it continues in that direction, I see it only going up from here. I really hope to continue seeing more panels and “immersion” events from them in the future. Looking toward future years, I hope that RTX continues to succeed and grow. Like anything, there is always room to improve, especially with how rapidly it’s growing. In order to better accommodate the crowds, a physical change may be in order. While the immersion rooms, panels, etc., had great attention, many areas could have used a bit more awareness in order to spread high volume areas more evenly and make the convention more wholesome in general. This just comes from experience and being aware of what the convention goers are interested in. Aside from that, a median pass between the normal pass and VIP pass may be a good idea. One popular example is Wizard World’s pass system, which I’ve seen used to great success for a high volume event. 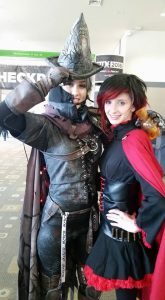 Overall, I had a fantastic experience at RTX this year, and I hope to return next year for an even better time. I highly recommend it to anyone who is a fan of Grumps, Twitch, Youtube, or RT! They clearly have the right direction for success and a solid foundation of guests and leadership to build upon. Thank you, Moof and all the other RTX staff for all your efforts, and I hope my praises and criticisms find you well.